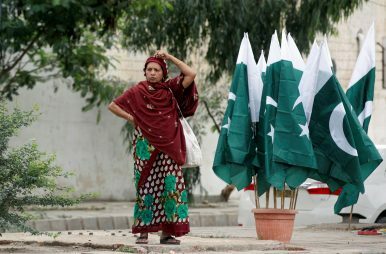 A woman adjusts her scarf as she waits for a bus next to a stall with national flags, ahead of Pakistan's Independence Day, in Karachi, Pakistan August 2, 2017. The recent BRICS declaration can be read as a gentle push from China for Pakistan to ditch the Taliban. The September 4 declaration made by the heads of the BRICS states after meeting in the Chinese city of Xiamen further raised the level of alarm in Pakistan first spiked by U.S. President Donald Trump’s speech announcing his new Afghan strategy last month. The declaration, among other things, specifically condemned the Taliban, and a host of other extremist groups — ISIS, Al-Qaeda, the Eastern Turkistan Islamic Movement, Islamic Movement of Uzbekistan, the Haqqani network, Lashkar-e-Taiba, Jaish-e-Mohammad, TTP and Hizb ut-Tahrir — three of which are said to have links with Pakistan’s security establishment. While Trump’s August 21 speech invited an angry reaction from the civil and military authorities as well as the public and intelligentsia in Pakistan, the Xiamen declaration was received as a gentle but clear reminder from the country’s so-called all-weather friend, China, along with Russia and three other developing countries that all’s not well with Pakistan’s Taliban policy. The seriousness of the BRICS declaration can be gauged from the fact that both Pakistan’s “best friend” China and its “worst enemy” India were signatories. There are several factors that makes the BRICS’ declaration a serious embarrassment for Pakistan. Most notable is the China factor. In April 2016, China blocked an Indian bid at the United Nations to blacklist Masoud Azhar, head of the Pakistan-based Jaish-e-Mohammad (JeM) militant group. Azhar is accused of masterminding the Pathankot attack in India. Apart from diplomatic and moral support, China’s multibillion dollar investment in infrastructure building under the banner of the China-Pakistan Economic Corridor (CPEC), which is one portion of its Belt and Road Initiative (BRI) connecting China with Europe and Africa, is seen as a great gift for Pakistan. However, China’s friendship has always been led by its economic and strategic interests. All the claims of “sweet, deep and tall” friendship with Pakistan will burst like a bubble the day China realizes that its interests are at risk in Pakistan. China is not only worried about the worsening security situation in Afghanistan, where the continuation of war is breeding new and more violent groups and strengthening existing ones, including the specifically China-focused Eastern Turkistan Islamic Movement (ETIM), but also needs stability in Central Asia to successfully continue with its Belt and Road Initiative. Next to consider is the Russian factor. Pakistan has recently increased its military and diplomatic contacts with Russia. The two erstwhile Cold War-era rivals have conducted several exchanges of top civilian and military personnel, with an unprecedented visit by a Russian military delegation to North Waziristan to witness Pakistan’s “success” against the Taliban. The visits and exchanges with Russia may alleviate Pakistan’s fear of isolation that could also be used for domestic consumption and even convey warning signals to its American allies that Islamabad is moving into Moscow’s camp, but that does not mean Russian consent to Pakistan’s support for the Taliban or other armed groups. Who knows better than the Russian leadership about the perilous nature of Afghanistan proxy war and the threat it poses to Russia’s soft underbelly via Central Asia? Russia’s consent to the BRICS declaration will further increase pressure on Pakistan regarding its support for proxies, be that focused on Afghanistan or Indian-controlled Kashmir. Then there is Afghanistan to consider. Naming armed groups such as the Taliban and the Haqqani Network as a “regional security concern” and asking for “an immediate end to violence in Afghanistan,” the BRICS declaration attested to the concerns expressed by Afghan leadership about terrorist sanctuaries in their neighborhood. Pakistan has long excelled at staying on the right side of its distant ally, the United States, despite circumstances — a feature of their “frenemies” relationship; but gimmicks have little chance to dazzle its closest neighbor China, which knows very well Pakistan’s dependence on its moral and material support. Though Afghanistan is not a signatory, the BRICS declaration must be seen as victory for its stance on the foreign roots of the ongoing conflict. Most importantly, the BRICS’ declaration emerged from a forum where India is an influential player. Pakistan sees India’s presence in Afghanistan as a threat to its political and economic interests in the region. While history and geography bind the two South Asian neighbors together, the bitter memories from independence in 1947 and the ensuing land disputes, much highlighted by security establishments on either side, motivate both to view the other as an enemy. Since 9/11, the two countries have shifted their tug of war to the Afghan turf. While India had long accused Pakistan of training proxies and sending them to fight in Indian-controlled Kashmir, Pakistan has recently started pointing an accusing finger back at India for arming and bankrolling the anti-Pakistan Tehrik-e-Taliban and Baloch separatists. The BRICS’ declaration naming Jaish-e-Muhammad (JeM) and Lashkar-e-Taiba (LeT) will be a moment to rejoice for Indian Prime Minister Narendra Modi, who seldom misses a chance to bash Pakistan, part of his highly aggressive diplomacy. It is high time for Pakistan to revisit its security calculus. Since the United States is sending more troops to reverse the Taliban’s gains in Afghanistan alongside inviting India to increase its role on the economic front, Pakistan needs to revisit its position. In desperate need of repair is Pakistan’s relations with the Afghan leadership. The new U.S. administration is more focused on keeping their country safe from terrorist attacks and for that purpose, it is accelerating efforts to target militants. Afghanistan is going to be a test case for President Trump. China needs peace in its neighborhood and so does Russia. For Pakistan, continuing support for the Taliban is a losing proposition, alienating its neighbors and allies. Pakistan, no doubt, has suffered huge losses in terms of blood and money. But the worst casualty is its image and trust both internally and abroad. Still, this is not the end. Afghan President Ashraf Ghani’s Eid message, where he reiterated his offer to talk, could be a fresh starting point. The Pashtun leadership on the Pakistani side could be used to bridge the gap. Solid guarantees from neighbors such as China and world powers like Russia and the United States could help overcome mutual suspicions. Daud Khattak is Senior Editor for Radio Free Europe Radio Liberty’s Pashto language Mashaal Radio. Before joining RFE/RL, Khattak worked for The News International and London’s Sunday Times in Peshawar, Pakistan. He has also worked for Pajhwok Afghan News in Kabul. The views expressed here are the author’s own and do not represent those of RFE/RL. The killing of senior al-Qaeda leader Abu Yahya al-Libi means drone strikes in Pakistan have made headlines again. But there’s plenty people are getting wrong.